Even if you like birds and animals, you probably aren’t keen on a family of pigeons wreaking havoc around your home, apartment building or business. Pigeon problems are obvious – including the constant droppings left behind and loud cooing sounds that never rest, and can disturb your sleep early in the morning. Pigeon droppings are actually pretty unhealthy. It will make you shutter when you consider the multitude of pathogens and diseases that may be present in pigeon poop. So, how do you get rid of pigeons like the one pictured above? Fortunately, there are a variety of options for removing pigeons that are easy and humane. They work around your yard and garden as well as on top of your house or outside your window in a tall building. And we’ll assume you haven’t come to the point of buying a rifle or a sling-shot to solve your pigeon problem (this is illegal in some locations in fact!). In this guide you’ll find the 10 Most Effective Ways to solve your pigeon infestation issues. If you just want to know what our favorite remedy is right now, we can tell you that it’s the Hoont Ultrasonic Outdoor Animal and Pest Repeller. It works for pretty much any situation to help send pigeons packing. You can find it at Amazon here. If you want to check out all our great remedies and find one or more that will work well for you, then read on. Our favorite option to remove and deter pigeons around your property or living space is to install an electronic bird repeller. This nifty device emits a highly disturbing sound wave that we humans are unable to detect with our own ears. This is because the sound is at an ultrasonic frequency; one that is too high for us to hear. This type of device is made for all sorts of animals, but this one is made specifically for birds. And boy does it work well to get rid of pigeons. The high-frequency and harsh noise is set off by infrared motion detection. The sound emitted essentially “scares” our feathered culprits away. It’s as threatening to them as using a water hose or banging pots and pans to frighten them. It’s alarming enough to pigeons that they eventually won’t want to come back to roost or congregate anywhere near the device. Once they make the connection that the area has this audible “alarm” they will learn not to come back. For some pigeons, it works right away. In other cases, it may take a few tries. But they’ll eventually have enough. The sound is adjustable to get things just right. The environment you place the repeller in can impact the way the sound carries, bounces around and is absorbed. You can work with the volume depending on your specific conditions. Start with a lower setting for pigeons and then adjust up as necessary. This product comes with a really long cord (50 ft.), or it can be operated with batteries. It can also be mounted so you can get it in an optimal position. The price is not bad for the problem it solves for you. What’s great about this is it’s the solution that requires the least amount of work on your part, and it’s entirely humane since there are no chemicals or traps involved. The device can also work well in city buildings such as the interior of large warehouses where it’s hard to reach and reroute pigeons away from tall vent areas and/or high up windows. Since it works so well to get rid of your pigeon problem, it may also make all other birds stop coming around as well. That may not be such a bad thing though! Can scare other animals too, such as your cat or dog! As you’ve probably figured out, pigeons like to nest and sit in particular kinds of places on your house, such as on your roof or under eaves. You’ve probably noticed these guys sitting around your balcony, deck, patio or yard. You may also find them on your window ledges or roof lines, hanging out (and leaving their evidence) around dormers and chimneys. The most effective way for proofing most of these areas from pigeons is to block them so they can’t make a landing and start roosting. A collection of long, pointy things can do the trick beautifully. Just check the “A/B” test in the photo above. One side with spikes, the other without…Which side is clean? If you have any kind of ledge on or near your roof, whether angled or curved the bird spikes linked above are a perfect solution. 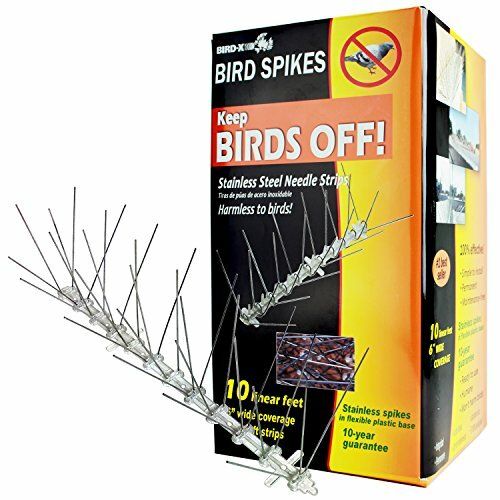 Bird spikes are a humane method that is 100% effective: No bird, from crows to pigeons can physically sit or nest on top of the spiny, steel spikes. The spikes are flexible and pretty versatile. In addition to roofs, they can be installed under eaves and overhangs, beams, windowsills, ledges, fences, gates, barns, you name it. Installation is done via heavy duty adhesive, screws or nails. It’s a pretty quick and easy enough job to do for a permanent solution. With a plastic base, you can simply cut to size as needed. Here are some ideas for how to make your environment pigeon proof. As a first step, carefully observe specifically where they are sitting or nesting. If possible place blocks or small pieces of wood in or in front of these areas. You can paint the wood the same color as your house or trim to make it look better. Block vent openings, lofts and eaves. While you’re at it, you can seal up any openings, large and small, which will help eliminate flies from entering your house. Another option is to place broken glass or brick pieces directly on the surfaces where pigeons land and gather. Whatever you do, you need something solid. Don’t use cloth or nylon netting. Pigeons have no problem getting this kind of material out of their way! If you want to “screen” them out, pick up some wire mesh or chicken wire that can easily be cut and form-fitted into the small opening you’re blocking. Be sure to fasten this material down with screws or nails. If they are sitting along your roof line at the edge, the best method to rid them here is to run a wire a few inches above this area. This may be difficult to place and secure, but it would do the trick in blocking and ridding pigeons from along the roof’s edge. In addition, you can lay out some “porcupine wire”, the kind with small metal spikes. This stuff can easily attach to edges and other surfaces of your house without looking too bad. It can last a long time (e.g. no rust in the elements) and can 100% keep pigeons out. If you have pigeons crowding around on the ground or getting in your yard or garden, decide if it’s reasonable to install chicken-wire or dark netting to block them. Can be hard to access roof areas, eaves, etc. Use of the old “scare crow” method can work just as well for deterring pigeons. Pigeons will not like it if they see a large replica of an owl or other predator, such as a large snake or large black crow. In fact, it’s a little disturbing to look at even for us! Its realistic appearance is enough, but add to it a rotating head, it will surely send a chilling pulse down any bird’s spine. And this will make them flee. The electronic owl has a free spinning head that can easily be moved in a light breeze. The movements are similar to that of a real owl. We all know how spooky that can be. The owl can also emit terrorizing “hoots” switched on via a motion-sensitivity system. Working up to nearly 10 feet, if a pigeon flies over or near, the on-guard owl will automatically sound off. Once a pigeon hears this and realizes what’s making the noise, they’ll be on their way. It just plain works, simulating nature’s predatory methods. The owl is light-weight, which is handy. As such, it’s best to mount it down to something. It comes with nails and a mounting plate, so it can be easily secured in your yard or on a barn, deck railing, porch, patio or roof. It’s designed and treated to withstand weather, rain or sun. You can also fill the bottom with dirt or sand to help with stability during stronger winds. As with any outdoor electronic device, it’s best to keep it out of the rain. In this price range, nothing is really impervious to rain showers. The most direct way you can keep a pigeon off your window sill, ledges, chimney, tree limbs and more is to use a sticky substance in these spots where they land and sit. Nothing repels pigeons and other birds better than sticking it to ’em, so to speak. You might be thinking this is a deadly and messy approach if you’re imagining birds getting trapped in a thick, gooey mess. This is not the same as those glue rat traps, where small rodents endure a long and slow death as they can’t escape with their feet glued to a pad. Thankfully, bird gel doesn’t work like that. This is merely a translucent paste that is gel based. A light coat simply covers the surfaces where pigeons like to perch. As they approach, they pick up on a repulsive scent. If they do land, the tacky-to-sticky feel will bother them, and they’ll leave. The biggest reason you’ll like this is because no normal bird will want to keep their feet on it. If the scent doesn’t get rid of pigeons then the sticky texture will. Once you get the hang of it, you’ll find that only a thin layer is needed to do the job. If you put on too much, then too many other things like leaves, insects or even small birds may actually get stuck in it. It can easily be removed with mineral spirits and a rag as needed. It can stop other annoying pests like ants in their tracks too. And depending on where you put around your doors or windows, even your average spider won’t get past it. Works on all birds, including woodpeckers, nesting sparrows, starlings, robins, etc. Bird reflectors are highly reflective materials that create chaotic dances with light. They have been a time-proven solution. Reflectors come in many forms but “flash” tape gives you the most versatility for placement and hanging options. Bird tape is a great compliment to spikes, netting and other scare tactics as an additional force against pigeons. The tape is made with a holographic pattern that interacts with light in ways that disorientate birds. The sharp iridescence provides a rainbow of quickly changing colors, making a unique reflecting pattern that sticks out in the environment. This is unsettling for pigeons, woodpeckers and the like. Add in a little breeze, and the effect is enhanced. Air movement will also cause it to make a noise when hanging straight down. While it’s called, “tape” there is nothing adhesive on it. You simply tie it into place. You can also glue, tack or nail it onto structures depending on where you put it. The most effective way to install it is to simply hang it vertically and let it do its magic. You have so many options when it comes to placement for scare tape. You can affix it to fascia boards, chimneys, trees or other objects around your garden or patio. It’s super easy to install as it’s lightweight and completely flexible. Also, customer service for the company “De-Bird” that sells the scare tape above is top-notch. They are always responsive and offer guarantees if things don’t work out. You can’t beat that. Some homeowners simply want to be as combative as possible when controlling pigeons. I guess sometimes we want to go to war when we’re out of patience. Well, there’s an answer that isn’t too brutal…water blasts! But we can’t always be standing outside armed and ready with our water hose. That’s where an automatic jet sprayer comes in. Just like it sounds, a forceful spray of water will get any pigeon up and running (flying). 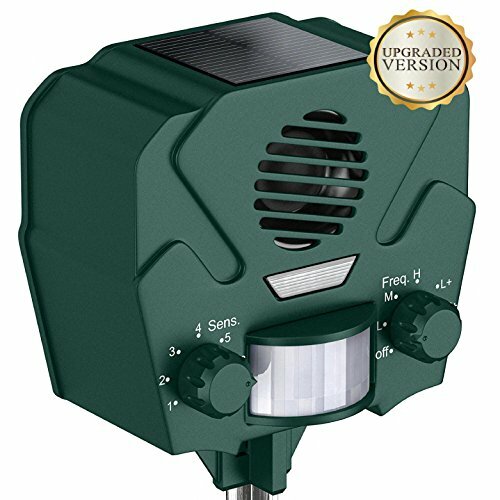 This nifty device works by connecting to your hose or irrigation system. It comes with a battery controlled (long-lasting), sensitive motion sensor that activates the forceful sprinkler as soon as motion is detected. 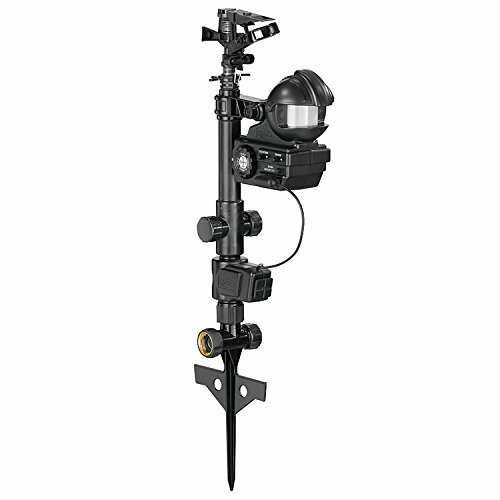 The range of detection is decent at 30-feet and the spray will blast for 5 seconds. When it engages and the valve options, a clicking sound occurs. This sound alone can begin to frighten birds away. When staked, you can go right at ground level or elevated. The sprayer can be mounted or simply staked into the ground near where your pigeon problem is. Aside from the device itself, you don’t have any scare tactic materials to look at like you do with reflective tape or “scarecrow” approaches. If you like more “gotcha back” remedies to getting rid of pigeons, this is the solution for you. A nighttime option is available so you can decide if it should go off during different times of the day. Doesn’t know the difference between birds, pets or people! 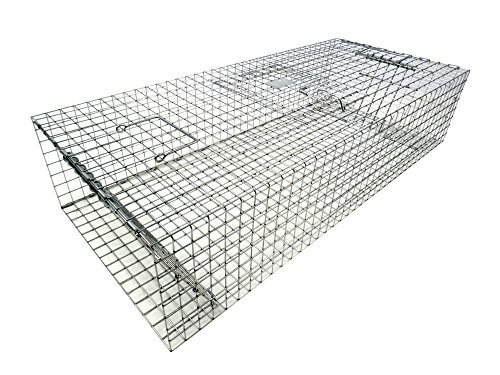 Trapping is another good standby when it comes to removing unwanted pests. There’s not too much to a pigeon trap other than to set it out, leave it, then move and release the pigeons far from where you live once you’ve captured them. As a double-door trap style, the model linked above works by baiting a pigeon in from either side. When the trigger plate is hit, the doors will close trapping the pigeon(s) inside. An attractive bait is required of course. You can try seeds, fruits, vegetables, cracked corn, wheat or millet. Check out more here to see what pigeons generally like eating. You might try feeding them without the trap at first. A trap like this is perfect if you just have a small family of pigeons you want to remove for good. It’s pretty effective. Just take your time on the baiting at first as described above. With all the solutions listed above, there are certainly ways to replicate some of them. Scare tactics can be created when it comes to visual devices. If you have the time, by all means try your hand at making your own scary owl or predator. One folklore is using rice to kill pigeons and decrease their local population. The idea is that after eating a bunch of dry rice, it will expand in their stomachs, and they will die. What happens is the stomach will let go of the expanding rice back out the way it came, and the over-stuffed bird will live on. In the end though, you have to figure out what your time is worth in your pursuit to get pigeons off your property. Anything you make will either require using some kind of supplies. You can certainly use things you have, but buying an existing anti-pigeon product just means you’re investing in the research that others have already done. One such tactic is to create loud noises or spray them with a hose each time they arrive, or if they begin to settle in for a nap. Like humans, pigeons will soon realize that your yard or garden is not a fun place to camp out, and they will leave. If you feel like you want to vent some frustration, this method may be for you. Unfortunately, pigeons may not learn all that fast. It may take many tries before they seek other places to go that are more peaceful. The irony is you’re trying to improve your environment, so reacting to a pigeon sighting may not be the most peaceful for you. That said, annoying these guys back may give you some satisfaction. It’s kind of like banging on your neighbor’s wall the next morning after they kept you up late with a loud party. Other than thinking your home is like their home in the wilderness (with small caves and protective perches), you need to find out if there are other reasons for these flying friends to be around so much. Like any pest, your goal is to take away what they like. For example, to rid paper-eating silverfish you need to remove or cover up paper and cardboard, etc. For pigeons, make sure any pet food or garbage is out of site and smell, and/or unreachable by these hungry birds. If you live in a densely populated city, removing pigeons by trying to put away food and trash may be a challenge – they love to go where there is free food, of course. Remove any standing water. You already know any bird loves water to drink and bathe in. Get rid of these drinking hole and baths. Netting is a great answer if you have fruits and vegetables growing in your garden. There’s not much you can do about these edible items attracting pigeons. But using the blocking technique mentioned earlier will do just fine. Pigeons do more than just bring annoyance. Unwanted nests can pose fire hazards. And their droppings can destroy your home’s paint, eat through concrete walks and patios, and air conditioning systems. Corrosive excrement is responsible for some hefty damage to our homes and even our cars. Doing something about it before it’s too late is entirely in your favor. In this guide, you’ve learned a number of ways for how to get rid of pigeons that are living around you. Remember to make observations about where they go, and then use our recommendations above and perhaps a little creativity to prevent and block them and force them to vacate. Since these birds are not native to North America, there is nothing protecting forceful pigeon removal if you need to resort to drastic measures. Hopefully, the above humane methods will deter them away from around where you live. You’re sure to enjoy your home and surroundings much better once you have some peace and quiet and fewer messes on your hands. Hey, you can always go enjoy pigeons in the park or city square! HRG: Yes! Try the owl with it’s crazy sounds or the auto-water jet. Both will work well depending on your outdoor area is set up. Like most birds, pigeons can carry fleas, ticks, or mites. It has been argued that they also carry diseases which can be transmitted to humans through direct contact with either the birds or their feces but these reports seem to be largely unsubstantiated. Their droppings however can damage the paint on your car or the finish on a building, and their highly-flammable nesting materials can clog up drains and vents. Health Canada claims the same lung disease caused by bat feces is caused by pigeon feces. Also the feces acid can eat away at stone and concrete. DO NOT CLEAN UP OR SWEEP WITHOUT A MASK ON!!! I have a bird feeder that takes care of a wide range of wild birds, which I enjoy watching over. If I use a fake owl, will it scare these birds away too? I do not like pigeons dominating the bird feeder. Pigeons are a serious problem as they breed rapidly and have been known to carry harmful diseases. Luckily, there are several ways to get rid of pigeons. repellents include anti-roosting spikes and scarecrows. These scarecrows can take the form of owls,snakes,cats or even people. However, to be effective, these scarecrows need to appear alive. Chemical pigeon repellents can also be use. Nice article.pigeon control may seem a bit difficult at first, but it is fairly simple. One of the effective way to get rid of pigeons is to install metal spikes or wires.Pigeon spikes are easily installed using glue,screws. There are many ways but the best is to use methods to scare them away.Sonic bird repeller is mostly used to scare pigeons and pest birds from areas where pigeons control is needed. im experimenting with a small heliium filled balloon attached to the 3rd floor window. its working for the most part. i came home and saw a pigeon on the far end of the roof but it took off when the wind blew the baloon up in the air again. Laser pointers work great. They blind them and they just sit there while you shine it in their eyes. Once scared off and forced to fly they fly right into the ground and become part of the food chain for a cat or other animal. Got rid of over a dozen so far that fly into the neighborhood because of morons with bird feeders. Inexpensive and works great. Works in daytime.